Home | General Bird Care | Baby Birds | Bird Research – Parrot Parents Give Specific “Names” to their Chicks! Bird Research – Parrot Parents Give Specific “Names” to their Chicks! Cornell University researchers have just revealed a most surprising bit of avian news that may show why Green-Rumped Parrotlets (Forpus passerinus) and their relatives are such good mimics. 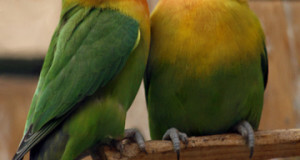 Field research has shown that parrots actually label each chick with unique vocal signature –essentially a name. 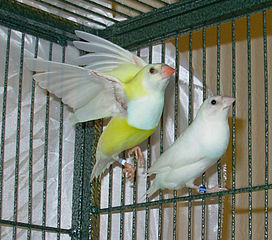 The chicks and other parrots imitate these names, and use them when communicating with one another! Everything in nature has a purpose, and so ornithologists have long wondered why parrots have such extraordinary abilities to imitate speech, sounds and the calls of other birds…surely it cannot be just to entertain their owners! We now have evidence that mimicry is likely vital to parrot social structure and survival. Observations of captive parrots led ornithologists to believe that the birds were using distinct calls when “addressing” different individuals…in a sense, each bird seemed to have, and to respond to, a specific “name”. Studies of video-rigged Green Rumped Parrotlet nests in the Venezuelan llanos confirmed these beliefs. Adults labeled their chicks with individual vocal signatures even before the chicks could imitate sounds. As they matured, each chick responded to its “name”, and other flock members learned and mimicked these names. Prior to this study, only humans and dolphins were known to use names for specific individuals. These findings provide the first evidence of the transfer of a socially acquired trait among parrots. Researchers believe that individual names are particularly useful to those species that utilize a fluid social structure, in which flock members come and go. The process also makes sense when viewed in light of several other parrot characteristics, such as long-term parental care and the high level of cooperation between flock members. It is speculated that individual parrots that “call another by name” are opening the door to further, more complex communication…future research will concentrate on this possibility. Also, it is hoped that an understanding of parrot communication will assist in studies of speech acquisition and learning difficulties in humans. Another recent study has shown that some parrots understand what they are saying to humans, and use specific words appropriately. Please check out this article for the amazing details. 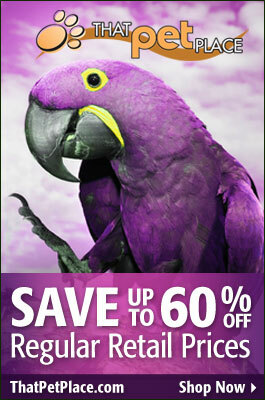 So, next time your parrot talks, pay attention…it may know and understand far more than you expect!